← Will this study help Medical Billers and Coders get claims paid? URGENT MESSAGE RECEIVED FROM AHIMA! I’d like to share the following information for everyone who knows #ICD10Matters. Ms. Margarita Valdez is asking for everyone’s help in reaching out and spreading important #ICD10Facts. This is a reminder that tomorrow, February 11th the Energy & Commerce subcommittee on Health will hold a hearing on ICD-10 implementation at 10:15am ET. Now is the time to voice your support for the new code sets with key legislators in Congress. Please call your legislators today! It’s urgent that Congress hears from you before the hearing. 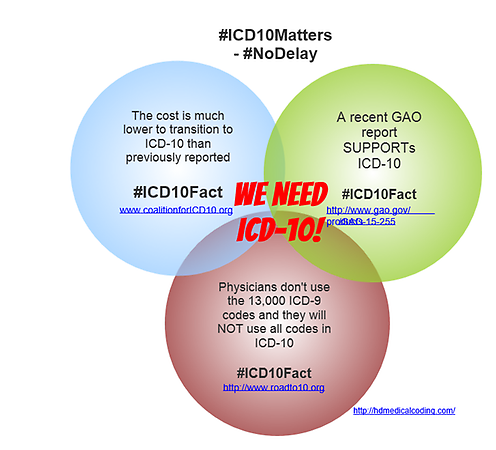 4) When you are done, call the other congressional leaders and Tweet also using hashtags #ICD10Matters and #SubHealth. This entry was posted in Heidi's Blog and tagged #CAT15, #HealthIT, #ICD10 Whisperer, #ICD10Fact, #ICD10Matters, #NODELAY, #SubHealth, AHIMA, healthcare consulting, Heidi Kollmorgen, ICD-10, ICD-10 Coalition, ICD10Watch, Medical Billing Services, medical coding. Bookmark the permalink.